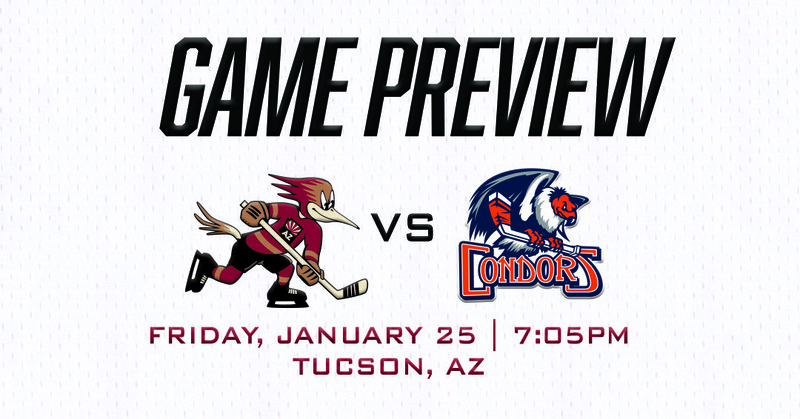 Pushing forward with what has been the most saturated portion of the schedule to-date, the Roadrunners host the Bakersfield Condors at Tucson Arena for the first time this season, the fourth of the teams’ eight scheduled meetings. The Roadrunners are a perfect 3-0-0-0 against the Condors this season, all three wins coming at Bakersfield’s Rabobank Arena, where the Tucson franchise is now 9-1-1-0 all-time. One of the hottest teams in the Western Conference and all of the American Hockey League right now, the Condors have won six-straight games, scoring five or more goals in each of their previous four. 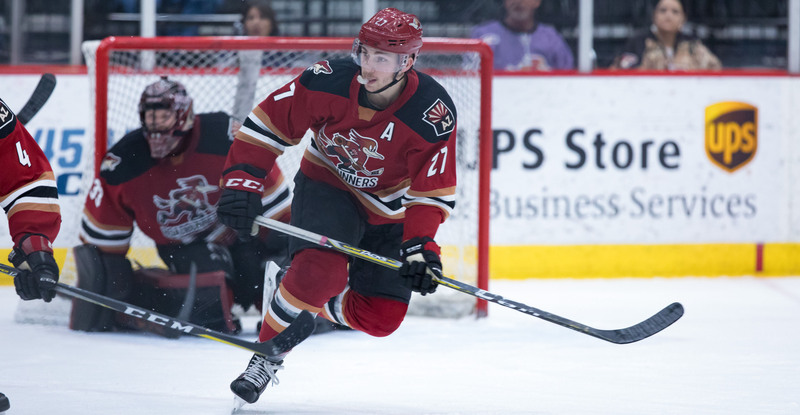 Laurent Dauphin, re-assigned from the Arizona Coyotes late Wednesday, is expected to return to the Roadrunners’ lineup tonight. In 30 AHL games this season, he has 18 points (6G, 12A). The Condors, along with the San Diego Gulls, come into the night with 47 points, trailing Tucson’s 50. The Gulls play at San Antonio at 6:30 PM MST. Tonight translates into a four-point game for Bakersfield. FIRE AWAY: The Condors rank #1 in the American Hockey League in shots per game, and by a pretty healthy margin. With an average of 34.53 shots registered each contest, Bakersfield’s offense has tested its opposition often, translating into an average of 3.35 goals scored in each of its games played. SHUTTING IT DOWN: Adin Hill enters the night having posted back-to-back shutouts; blanking the Colorado Eagles with 21 saves last Saturday and doing the same to the Texas Stars with 39 saves on Wednesday. Hill, who is 1-0-0 against Bakersfield this season, having stopped 25-of-26 in the Roadrunners’ 2-1 win on October 13 at Rabobank Arena, has not allowed a goal in his last 123:26. HOW HOT? : Real hot. Michael Bunting, named to the 2019 AHL All-Star Classic roster on Thursday, has been on an absolute tear of late. He comes into the evening with goals in four-straight games and points in five. Since returning to the Roadrunners from his latest NHL recall, the 23-year-old forward has eight points (5G, 3A) in five games played. TWELVE: Defenseman Kyle Capobianco surpassed his rookie point total (30) on Monday night and in 12 fewer games. He is the franchise’s current all-time assist leader with 52. The second-year pro enters the night leading the team in points with 31 (7G, 24A).